I’ve been riding motorcycles for more than 40 years. I bought my first bike, a little Yamaha RD350 two-stroke, in 1973. I really wanted a BMW 750cc model, but my father wisely advised that, since I had no experience of riding, maybe I wouldn’t like it. Nah! But it was good advice all the same, because I discovered that you fall down a bit with your first bike—first rainy day, first wet manhole cover, first experience sliding down the road with the bike tumbling on ahead, showering sparks. But I persevered and did buy that BMW R75/5 the following year. I’ve been a fan of big, heavy, powerful motorcycles ever since. Usually in black, if I can get it. Sometimes I go off motorcycles entirely. Sell the bike or bikes in hand and vow to drive a car forever more. At the time, it usually feels as if I have acquired too many tachyons, like the starship Enterprise—or too many near-misses and unrealized bad luck—and need to equilibrate to a less scintillating state. Once I sold my motorcycle thinking it would be not all that different, except cheaper and probably healthier, to try commuting on a bicycle. I hadn’t been on a bicycle since the sixth grade, of course. I got out in city traffic and discovered that I had zero acceleration (except what I could pump into that chain with my own two feet), zero braking power (two little rubber erasers gripping the wheel rims! ), and zero mass (well, maybe twenty pounds of pipe and sprockets) under me to stabilize the ride. The bicycle lasted about a week. Sometimes, instead of going off bikes for a couple of years, I flip the other way and own two motorcycles at once. Some people find this strange. But look, I know where in the Bible it says I can only have one woman—and she was a darn good one, too—but I don’t see where it talks about only one motorcycle. Usually, the decision is based on having a combination of engine types and riding positions. But so far with me, as with the Sith, there are only two at any one time. Over the years, I’ve owned more than a dozen of the big motorcycles. As Col. T. E. Lawrence favored the Brough Superior marque, I favor BMWs for their reliability, good engineering, and maintenance-free shaft drives. My stable has had fourrteen of the German beasts, including six of the two-cylinder, air- and oil-cooled R bikes and eight of the four-cylinder, water-cooled K bikes. Lately I’ve taken an interest in Harleys. “Why?” my BMW friends ask in horror. “Well, because …” I reply. Because they are big and stable, well constructed if not exactly a modern design, and made in America. The native Harley is not all that powerful. I’ve had two of them, starting with an air-cooled Dyna in which I immediately installed the 103-cubic-inch engine, to get the power up to about 75 horses. Then I discovered the V-Rod, which has a more traditional V-twin engine—with the pistons on separate cranks, instead of sharing a single crank like a rotary engine—as well as being water cooled and fuel injected. All of this brings the V-Rod up to the output and powerband of a European motorcycle. But the Harleys have been more of a flirtation than a love affair. My heart still belongs to the blau-mit-weiss roundel. I had thought that the K1600GT would be my last motorcycle—but never say never, especially about riding. 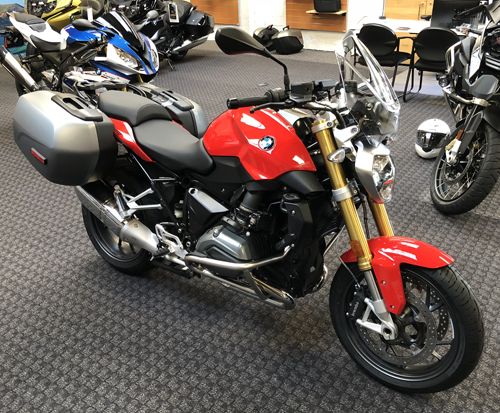 The Big K was sleek, powerful in terms of both horsepower and torque, and loaded with options like electronic suspension adjustment, tire pressure monitor, variable riding modes, and a cool adaptive headlight that can actually see around corners. It was perfect for dominating the freeway. But, as one of my friends once said, “It’s a boat.” Horsing that 700-pound frame around in a parking lot, or trying to pull it backward out of a parking spot or bring it level on any kind of a grade, was just impossible. So after selling it in the fall of 2017, I had thought to go off bikes for all time. But still … I enjoy batting around the hills on a motorcycle. My latest entry in the Iron Stable is the 2018 R1200R. It has the same configuration as my first BMW R75/5—the neutral, upright seating that has become known as the UJM, or “universal Japanese motorcycle.” It has a 1200cc boxer engine that is now water cooled, at least at the cylinder heads. It has all the options that the Big K had, except a sound system that I almost never used. And it’s red! What more could a fella want?